Since Barnet Council changed its website, some information sources have been completely inaccessible or have dead links that lead nowhere. 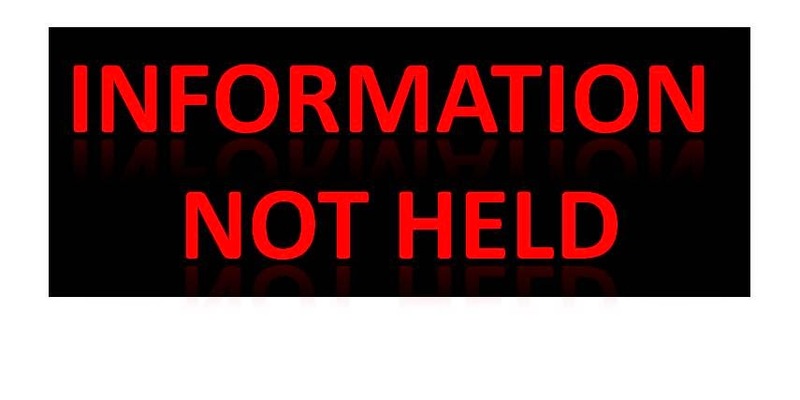 In particular it has been impossible to look at previous Freedom of Information requests and the responses provided. If you click on the link on the website it takes you to a page where you can fill in an FOI form but not see previous requests. I drew this to the attention of the Council who promised to get it fixed but, as with so much the Council says, it was an empty promise. Looking via Google at cached searches I managed to find the previous FOI's and one in particular caught my eye. It asked for Information relating to Fixed Telecommunications and Internet Services, an issue that has been the source of problems in the past. So what was Barnet's response? The same answer is given for FOI requests about Servers, IT maintenance and ICT strategy, although a request about printers does get an answer even though it acknowledges the contract is provided by Capita. This represents a major problem and undermines genuine transparency about costs of operating ICT. The council maintain that they have signed a ten year contract with Capita and therefore they don't need to worry about costs. That seems mad to me given that the cost of ICT equipment has plummeted over the past 10 years and may continue to change, develop and be sourced at a lower costs over the next ten years. Without the public being allowed to question how much is being spent on this very expensive cost centre, we don't know whether or not Capita and making excessive profits from this area of their contract payments. "We do feel there is a strong case for designating outsourced services as falling under FOIA when they are of significant monetary value and long duration: for example, those over £5 million in value or continuing over 5 years or where the contractor solely derives its revenue from public sector contracts". That would definitely apply to Capita's contracts with Barnet. With the Children's, Education, Libraries and Safeguarding already in the process of being outsourced (see the tender here), there will be virtually no services that are not provided by a contractor and everything will be hidden behind the cloak of commercial confidentiality. 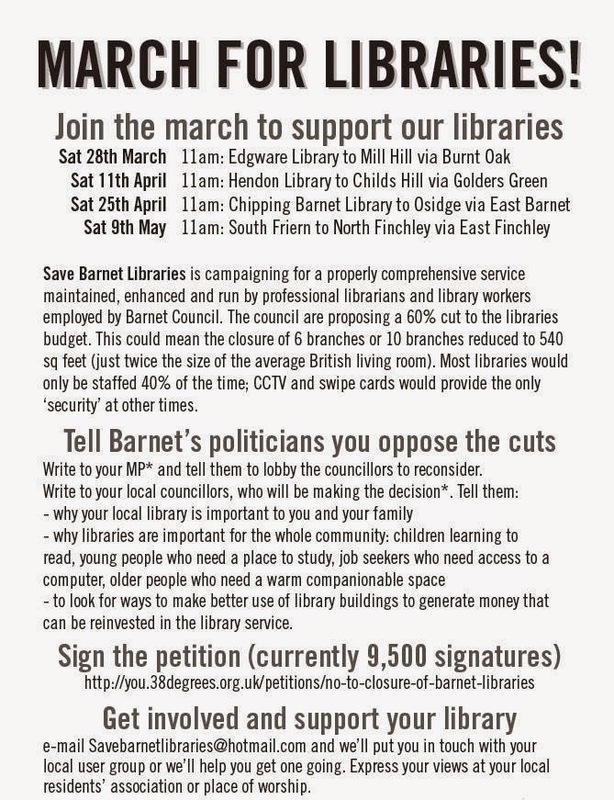 Barnet will be discussing Cllr allowances at the meeting on Tuesday, the same meeting where they will be receiving a petition on library closures. Cllrs currently receive an allowance of £10,597 and, in addition, certain Cllrs receive a special responsibility allowance. These range from an additional £35,000 for Richard Cornelius as leader of the council down to an additional £2,368 for Chairmen (even women are Chairmen) of the Residents Forums and Vice Chairmen of 8 committees. 17 Chairmen of committees receive an additional allowance of £15,333. This ranges from committees which sit frequently such as the Planning Committee - 10/11 times a year, to those which sit just four times a year such as the Housing Committee or Community Leadership Committee. The Licensing Committee Chairman attracts a lower special responsibility allowance of £8,852 but in 2014 this committee only sat twice. From what I can see, 26 of the 32 Conservative councillors receive some form of special responsibility allowance whereas only one Labour Cllr receives an additional allowance, Alison Moore, as leader of the major opposition group. Some Cllrs work hard for which they receive their main allowance and I understand why the leader and opposition leader receive an additional allowance as they have to devote a great deal of time to the running of the council but the rest of the special responsibility allowances seem to me like a way to reward loyalty within the Conservative group. If we really want to make cuts, I would do away with all special responsibility allowances other than for Cllr R Cornelius and Cllr Moore. If committee chairmen didn't receive an allowance then maybe the council would rationalise the number of committees. 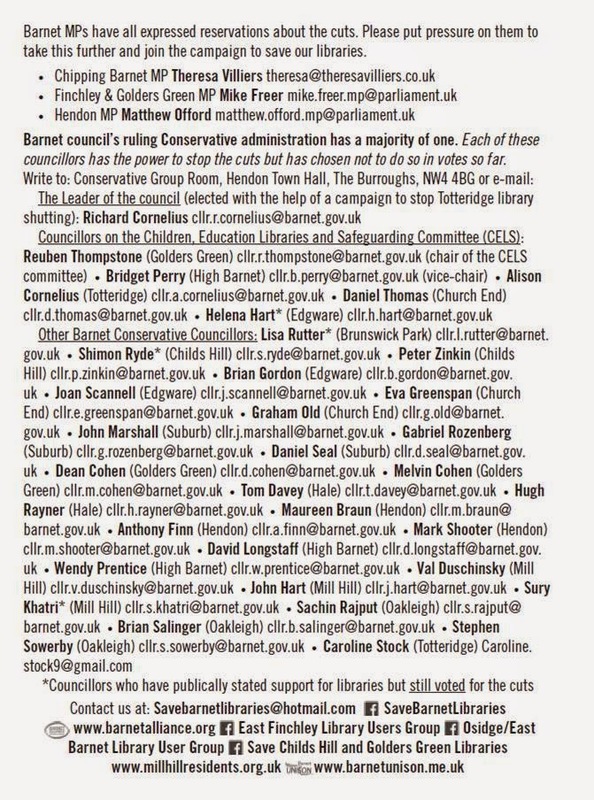 By way of example of how the current system isn't working is Danny Seal, the globe trotting Cllr for Hampstead Garden Suburb who has only attended 9 of the 15 meetings he should have attended, or just 60%, see the details here. However, in addition to his standard allowance of £10,597 he receives an additional allowance of £2,368 for his role as Chairman of the Finchley & Golders Green Residents Forum. Imagine an employee turning up only 60% of the time and asking for extra payment. They would be shown the door. By cutting out special responsibility allowances it would reduce the allowances bill by approximately £300,000 a year and in addition would do away with the patronage system that buys loyalty with committee chairmanship roles. Perhaps Cllrs should consider this before they go making cuts to the library and other essential services which residents value on Tuesday.